The excellent location to explore Budapest by night & day. We guarantee you a warm and friendly, safe and informal location in a busy neighborhood with flexible and helpful staff. VERY amazing hostel with really friendly owners. I&'d highly suggest staying at this hostel again. My girlfriend and I stayed for two nights. Very central, clean, lots of space, superb in case you wanna cook for yourself! Excellent location, straightforward to find, really fresh and clean room. Boulevard Hostel is a really nice, small and central Hostel at a busy square with a lot of different bars and restaurants. From the hostel you need about 15 - 30 mins to the different sightseeing places. (You can either walk, I suggest that- or go by tram or by Bus! To the Hostel belongs a Pub/Restaurant, which i highly recommend. It is frequently jused by traveler and by local habitants! It has awesome food! The hostel itself is small, in total there are only 3 rooms! with 2, 3 and 4 beds! So you really get in contact with the other visitors (if there are any). Inside the hostel are 2 Bathrooms, each with shower and toilet) The hostel is really tidy and has a properly equipped kitchen! Boulevard Hostel was a very nice spot to stay at. I would stay there again any time! This property was amazing. 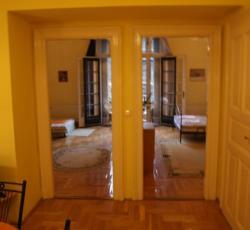 In the middle of Budapest, an amazing large Apartment. We were with a group of pals and rented the whole appartment, and I must say: we could not be happier with our accommodation. We had three bed rooms, that are comfortably large (not hostel-like, it looked far more like a hotel), plus two bath rooms and a kitchen with a spacious sitting area. I would recommend this place to anyone as long as I am not planning to go to Budapest, simply because then I would want it! To me it seems like 15-20 quid per night would still be an excellent value for what we got, it was however almost a third of that price! Staying in this Hostel was like a dream. I rented a triple private apartment with shared bathrooms. The room was extremely clean an tidy, we had bed linen a towels and the beds were plain awesome. We had 2 couple beds which was great. The common areas, like cooking area and bathroom were clean and organized. Location wise, it couldn&'t be better. in less then 20 mins walking you can either be at the bridge or at the Szechenyi Baths (which I extremely recommend). The reception is at the Kiado Kocsma bar, right next to the building. Each girls who attended us were awefully nice and trusty. The bar is also a extremely good hangout place. They have extremely good Hungarian beer and one of the most effective and cheapest goulash I&'ve eaten. Try their Lemon poppy seed cake. To die for. Enjoyed my stay extremely much. Would go back there inside the blink of an eye. The hostel was very centrally located and also the staff very helpful. The notice board within the dining room area had very helpful suggestions on exactly where to go in Budapest. It is like an appartment, so you have lots of facilities. The property owner also wones a realy nice cafe down the street, in which you get a discount. The location is great as properly as the room was spacious. There is a bath tub - nicely equipped kitchen - apartment shared with max 7 people, two bath rooms - a little like couchsurfing. * Boulevard Hostel rated 4.78 out of 5 based on 9 customer reviews. Hostel reviews with a star rating are sourced from HostelBookers. If you find Boulevard Hostel with the same booking conditions at a lower rate somewhere else on the internet after you have booked, we will refund you the total difference.